The team at AMB Sports + Entertainment, the AMB Group subsidiary that oversees the scoreboard technical facilities and operations at Mercedes-Benz Stadium, gave the facility a technical upgrade to ensure that it is ready to meet the expectations of Super Bowl fans and also lays the groundwork for future growth. From left: Evertz’s Gaines Johnson, AMBS+E’s Ben Dolinky, Evertz’s Allan Canney, and AMBS+E’s Jason Cothern and Pete Soto have worked hard to get the scoreboard operations Super Bowl-worthy. The biggest technical change was the addition of a second Ross Xpression Tessera system. 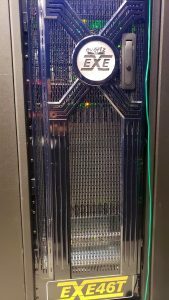 The Tessera system can manage multiple Ross XPression BlueBoxes, the high-end 3D graphics engine found in the Studio version of Xpression but without the user interface. 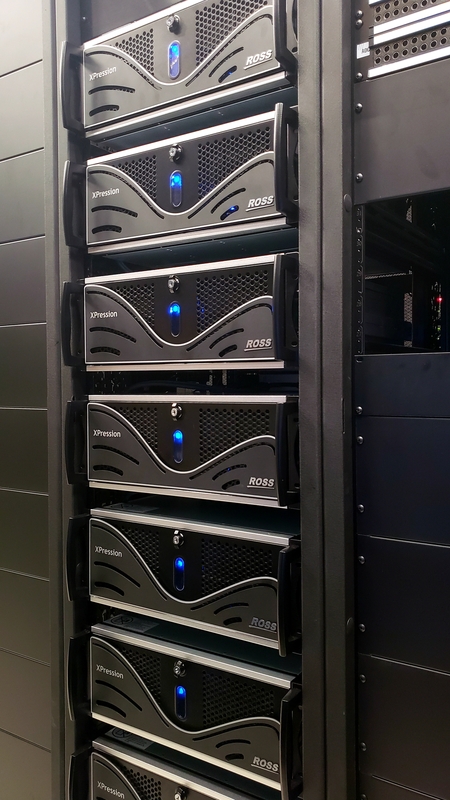 At Mercedes-Benz Stadium, the Tessera powers a system with seven BlueBoxes, six of which are dedicated to the Halo board, ensuring that broadcast images can be scaled in real time and in sync across the six BlueBoxes. The venue’s Halo 360-degree videoboard requires all of that processing power, but a single Tessera system has its limits. Mercedes-Benz Stadium added a second Ross Tessera system and seven Ross Xpression BlueBoxes. The second Tessera system also gives an additional level of redundancy for the Super Bowl because the two systems will run in parallel. 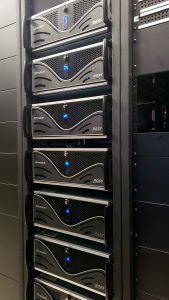 In addition to Tessera, Ross provided two fully loaded Acuity switchers for the stadium control room, two Carbonite Solo switchers to drive an additional display, the Megacolumn, with a 1,416×2,016 resolution, and openGear to integrate with other production equipment, along with supporting training and creative services. The Mercedes-Benz Stadium team also increased from nine to 12 the number of Grass Valley cameras that will be in use for the in-house coverage of the Super Bowl. One vision for the future is the possibility of creating a mobile-cart system, which can be moved around the venue and provide a camera hub for special events or live hits. That system can be patched into the network, and the camera sources connected to that cart can be received in the control room. One interesting aspect of the facility is that the Ross XPressions are SMPTE 2022-6 while the rest of the system makes use of ASPEN. The team installed Evertz IPGs directly inside the Ross frame so that the 2022-6–to–ASPEN conversion can occur from the BlueBoxes to the IPG. The IPG is also able to provide ASPEN into the core EXE router and SDI to the Daktronics system for the scoreboard. There will also be an interesting legacy from the Super Bowl: an IPG was placed at State Farm Arena and connected directly to the EXE core there. 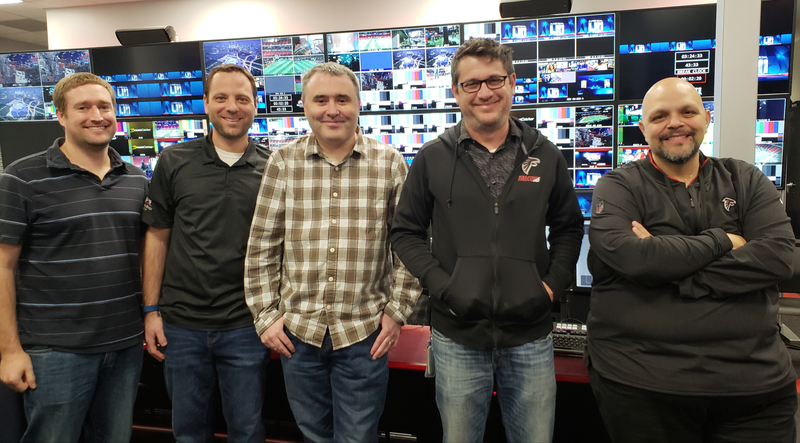 In the future, the team at the arena can connect the existing SDI workflow into the IPG, which will encapsulate it to ASPEN and send it over fiber to the Mercedes-Benz Stadium infrastructure. The team at the stadium can feed the ASPEN signal into the IPG and de-encapsulate it to SDI for in-venue use. The next potential step is to link the two Evertz DreamCatcher networks. The technical advances are all part of a continual evolution at Mercedes-Benz Stadium. When it opened its doors two years ago, the issue facing the production team was how to take advantage of the unique Halo scoreboard in a dynamic and satisfying way for fans. According to Pete Soto, senior director, game presentation, AMB Sports + Entertainment Group, creating a truly great show took a lot of trial and error, and the team spent about three years prior to installation imagining how they could do it. And, besides the Halo, there was also the Featherwall and Megacolumn displays to consider. It seems that every major new stadium is looking to stand out by expanding the definition of what a scoreboard should look like and be capable of. Inglewood Stadium, which will be home to both the Los Angeles Rams and the Los Angeles Chargers will have an “Oculus” that will be a double-sided scoreboard that is 50 ft. tall and 120 yards long.